The end may not be nigh, but with vicious storms, severe flooding, and rising temperatures becoming the new normal, the apocalypse might be closer than we think. In the case of a cataclysmic event that could displace thousands, if not millions, of people, the availability of emergency shelter becomes a pressing concern. 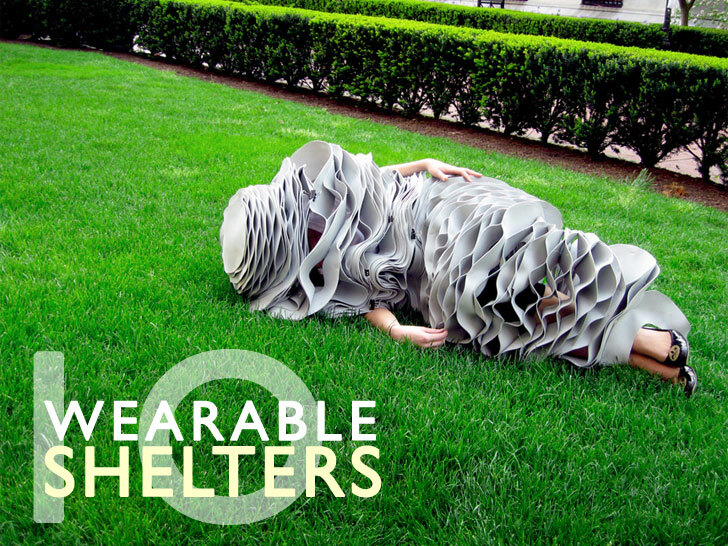 Here are 10 "wearable shelters" that serve as protective all-weather garments in the day and insulating dwellings at night. In 2009, a trio of Philadelphia student designers showed off the perfect apparel for our uncertain times. 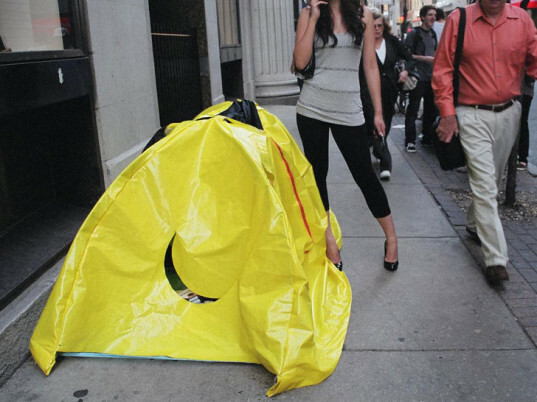 Asked to fabricate solutions for a hypothetical post-disaster scenario, Jin Hong, Sebastian Brauer, and Jackie Starker conceivred of the “Wearable Shelter” collection, a line of waterproof coats that transform into sleeping bags or two-person tents in the event of an emergency. London designer Tom Dixon collaborated with Adidas on a capsule collection of travel essentials designed to serve as a “complete wardrobe for every possible occasion.” Among the utilitarian yet adaptive garments? 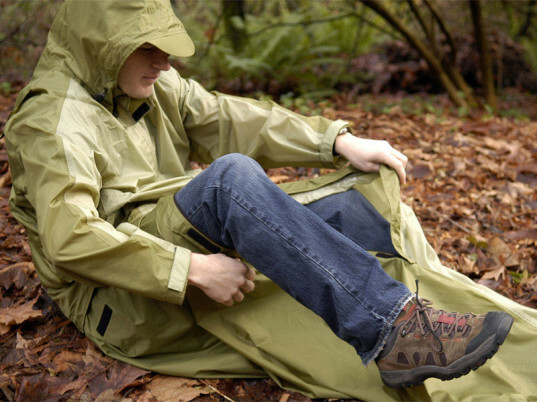 A padded parka that transforms into a sleeping bag. Who says you can’t take it with you? 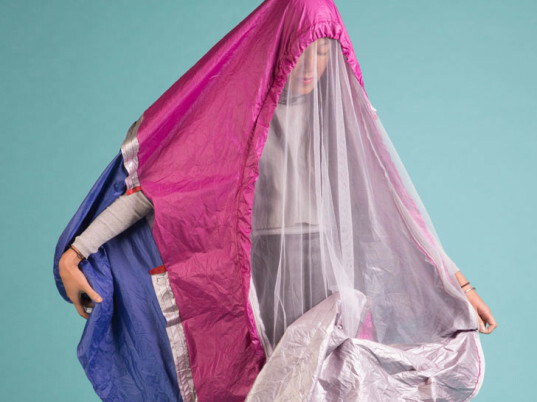 “Portable Home,” a wearable-shelter concept by three Middlesex University students in London, is part wacky ensemble, part escape strategy. Franziska Lusser, Hanna Nielsen, and Luca Romanyi, who hail from Germany, Sweden, and Hungary, respectively, designed Portable Home as a response to their nomadic existence. 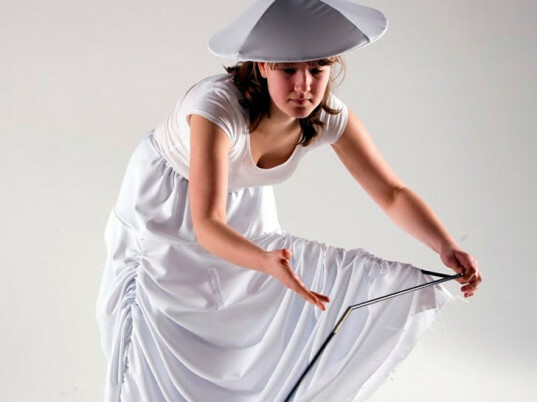 In addition to a skirt that turns into a tent (complete with a window view), the outfit also includes a bag that unfolds into a shelf for displaying books and other mementos. A period of economic crisis in the late 1980s spurred British designer Lucy Orta to develop “Refuge Wear,” a line of portable, autonomous habitats that offer mobility, protection, and meditation for itinerant populations. One version even allowed four or more individuals to combine their garments into a multi-person tent. Justin Gargasz describes the “Vessel” as a self-contained “physical as well as psychological escape.” A master of disguise, the medium-weight reversible jacket expands into a full-body cocoon, complete with an inch-wide strip of mesh for peering out of. For easy transport, it also collapses to form a totable sling bag. 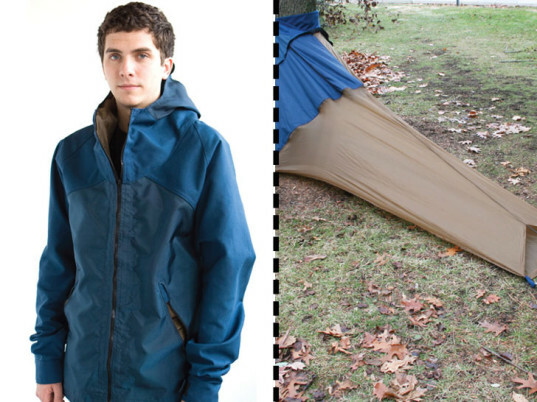 Meet JakPak, a lightweight, weatherproof jacket that moonlights as a one-person tent, complete with mosquito netting and a sleeping bag. With less gear to schlep around, it’s happy trails indeed for camping, hiking, and outdoors enthusiasts. You think you’re cold? Try being one of Detroit’s 18,000 homeless. To help her city’s chronically destitute, a quarter of whom are children, college junior Veronika Scott designed a heated, waterproof jacket that turns into a sleeping bag at night. But the Elements S(urvival) coat, which geminated as a school project, is more than an instrument of warmth. By employing homeless people to produce the jacket, Scott hopes to create jobs, impart valuable skills, and restore dignity. Perhaps more whimsical than practical, the "Veasyble" collection serves to create a sense of isolation amid chaos. A set of four habitations that can be deployed at a moment's notice, the pieces furnish an "ornament that can be worn, a gesture to transform, a secret place for personal intimacy, and a reminder of our exterior aspect." 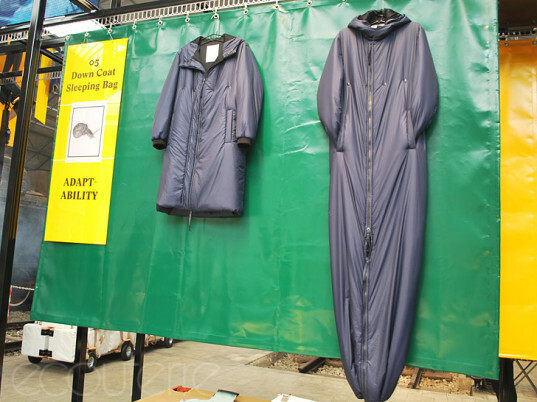 Proponents of Buckminster Fuller's practice of "dymaxion sleeping" will appreciate the "Sleep Suit," a semi-permeable, transportable, and adjustable cocoon that allows its wearer to get the prescribed four 30-minute naps every 24 hours. 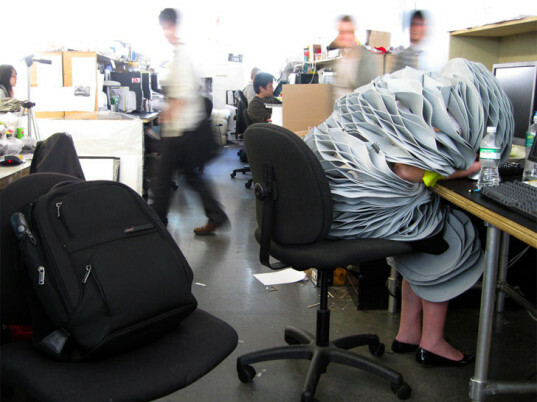 Composed of accordion-like pleats, the finger-trap-like covering "reduces the form to exactly what the sleep program requires," says designer Forrest Jessee. "The result is a suit that supports the body in all the right places and at the same time both filters and acknowledges its surroundings and occupants, providing a sound nap in a variety of different positions and environments." Justin Gargasz describes the "Vessel" as a self-contained "physical as well as psychological escape." A master of disguise, the medium-weight reversible jacket expands into a full-body cocoon, complete with an inch-wide strip of mesh for peering out of. For easy transport, it also collapses to form a totable sling bag. A period of economic crisis in the late 1980s spurred British designer Lucy Orta to develop "Refuge Wear," a line of portable, autonomous habitats that offer mobility, protection, and meditation for itinerant populations. One version even allowed four or more individuals to combine their garments into a multi-person tent. London designer Tom Dixon collaborated with Adidas on a capsule collection of travel essentials designed to serve as a "complete wardrobe for every possible occasion." Among the utilitarian yet adaptive garments? 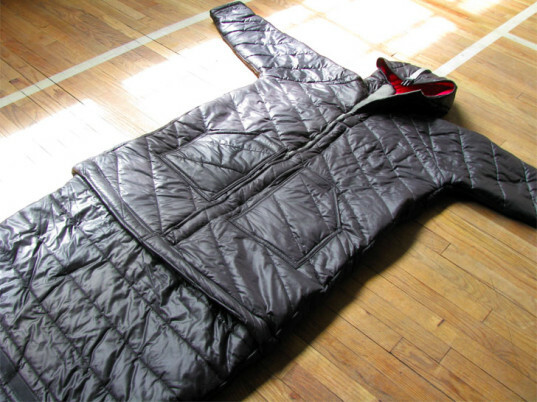 A padded parka that transforms into a sleeping bag. In 2009, a trio of Philadelphia student designers showed off the perfect apparel for our uncertain times. 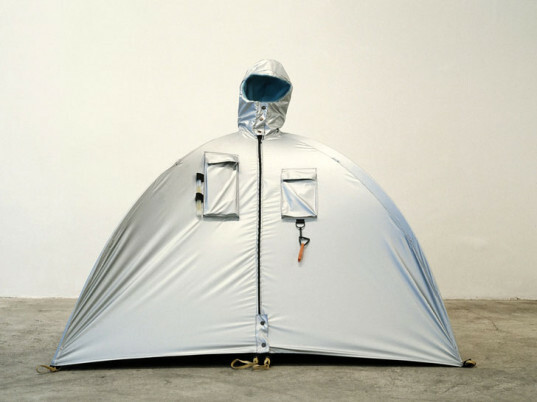 Asked to fabricate solutions for a hypothetical post-disaster scenario, Jin Hong, Sebastian Brauer, and Jackie Starker conceivred of the "Wearable Shelter" collection, a line of waterproof coats that transform into sleeping bags or two-person tents in the event of an emergency.